Peanut butter & jelly. Peas & carrots. Chocolate & avocado. Who knew that chocolate and avocado were such a power couple? 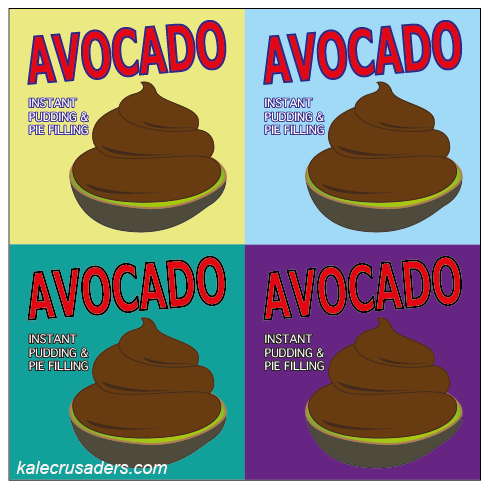 Emily Levenson, thank you for introducing us to chocolate avocado pudding, a.k.a. chocamole. P.S. Looking for some more chocolate & avocado ideas? How about avocado chocolate mousse cake or avocado chocolate fudge? P.P.S. Our deepest apologies to Mr. Warhol, who would never have supported pudding without the mass production. Welcome to our first installment of Your Ultimate Cartoon Connection Adventure (YUCCA)! Say hello to our first adventurer, Eugene Wu, who is an incredible artist, fruit lover, and early Kale Crusader. Take it away, Eugene! Sat-sumo spends a lot of time hanging with his brother Clementine's close friends. But really, he's best seen doing his own thang, eaten by the bushel! P.S. Would you like to be the next YUCCA guest cartoonist on Kale Crusaders? Reach out on Twitter or email us. 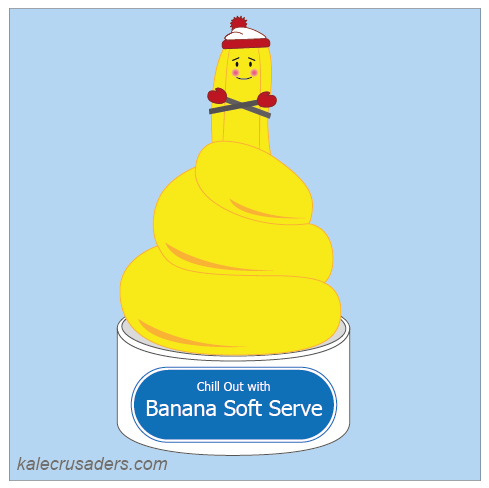 The internet has not been the same since Gena Hamshaw of Choosing Raw introduced Banana Soft Serve to the world back in 2009. Some of our favorite variations include PB Chocolate Chip Banana Ice Cream by Cupcakes and Kale and Banana & Chocolate Soft Serve by Cadry's Kitchen. How do ripen an avocado in a jiffy? Place it in a paper bag along with a banana. What do you do if your bananas are too ripe? Bake banana bread. Do you want to replace eggs in your baked good? Mix in a mashed banana. Do you want to reduce the oil in your baked good? Mix in a mashed banana. Do you want some bon bons, stat? Slice bananas, coat with melted chocolate, and freeze. 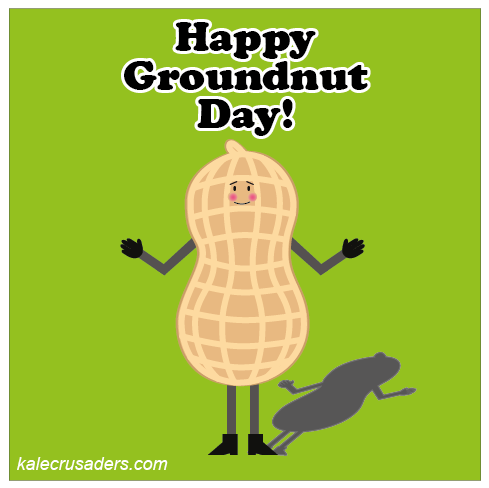 Happy Groundnut Day, kids! According to legend, if Mr. Groundnut sees his shadow it means six more weeks of winter for us. Luckily, nuts don't have very good eyesight. In the meantime, you can keep warm with Kenyan ugali with peanut stew, spicy peanut chaat, and Thai pizza.